Thought I would try to editorialize about a fifth that is more mainstream, one that most collectors own or have owned. Most long time collectors have had numerous examples of this bottle, and there are many of us that are currently trying to collect groupings or 'runs' of this bottle. The good ol' Star n Shield Cutter. There is that name again, Cutter! Some readers of this blog profess that they might not be interested in Cutters! Stop reading now!! If you are that jaded, my sympathy goes out to you. There are going to be many, many posts about Cutters. More is known about Cutter, Hotaling, Martin, Hardy, Moorman, and all the other names and bottles associated with these names than just about any other aspect of early whiskey collecting. If you read enough about them, hey, maybe you'll develop a fondness for some of them. After all, it was Hotaling that started this party with the first embossed fifth. E. Martin was right behind him with his first fifth the J.F.Cutter(t-46). I am working on a post that lays out the time line of Cutter bottles, for now we will just jump into dis cussion about the J .F.(t-46). This embossing pattern was used for a very long time, maybe the longest of any western glob top fifth. First used in 1870, it was still being used into the early to mid 1880's. There are 4 variants now recognized for the J.F.(t-46). The first variant or the first bottle used is definitely the 'pointed A' example that has the big stove-pipe top and unusually short neck. The top is similar to the first Hotaling bottle (t-49). That's not a coincidence, the colors are the same too. It starts out being a littledifficult for collectors to sort this "variant 1" out, but after you have seen a couple of them and compared them, it is a no brainer. Some of the variant 1's are very whittled and crude. Super nice, with strong, sharp embo ssing. I used to think that most of them were that way, but I have seen a few duds. The colors that this bottle is found in are dark olive amber, dark choc. amber, and green. Just like the Hotaling(t-49). 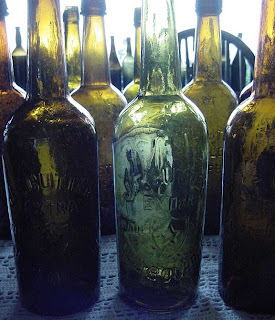 I would venture a guess t hat these bottles were blown at the Pacific Glass Works. I think the Hotaling(t-49) almost certainly was blown at Pacific, just because it is in service exactly during the "burn-down period (1868-70)" of S.F. Glass Works. In my simplistic thinking, the glass colors match so closely with this J.F. (t-46var.1) they are being made at the same place. Digging in Utah has produced some interesting information, or conclusions about dates of distribution of bottles. Digging some of the early mining districts, particularly the famous mines in these districts, has provided clues to the actual dates certain bottles were used. The dates that mines were in operation and that miners occupied boarding houses for these mines is documented quite precisely in the early Utah Mining Gazette and S.L. Tribune. If you know that a certain mine was active for just 6 months in 1870, the bottles you find there can be dated with some precision. Privies and dumps can be used for an unknown amount of time, throw backs make it even more confusing. There have been 40 to 50 examples of glob top J.F. 's found in Utah, only 1 of which was this earliest variant. It was found near Ophir, Utah, in a small district called Lion Hill. The pocket mines of silver chloride at Lion Hill were shallow and worked out quickly in 1870-71. Most of the 'variant 1' examples have come from the San Francisco bay area. Probably 25-30 known in dark amber shades, I only know of a couple in green. A digger in Austin, Nevada about 15 years ago dug a very nice, and very green example. I tried to get it from him, but no way -no how. Then he shows up at the Downieville Show with it and for whatever reason I hesitated. That one got sold, leaving me standing around like a penny waiting for change, and still looking for a green one. J.F.Cutter(t-46var.2) examples have been found through out Nevada, California, northern Utah, and probably Oregon. This is the embossing pattern with the "flat-topped" A's, as opposed to the pointed A's. Different mold, but used approx. the same time as the variant 3's (1871-75 ). Possibly the brand's sales had grown to such a degree that molds were being used at both glass works. 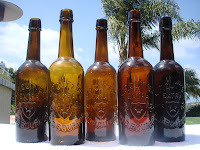 The "flat A" bottles are found along side the "pointed A" variant, in fact the variant 3 or "pointed A" bottles seem to have even a longer period of usage (1871-77), so it is not a replacement mold. Colors of this variant-2 seem to tend more to the medium amber, orange amber shades. I have not seen a green example of the variant 2. Not near as much color range as the variant 3 bottles. I would say usually not as much whittle and crudity either. Rated as common, probably 50+ examples known. 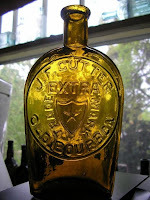 J.F.Cutter(t-46var.3) examples have been found in generally the same areas as variant 2 bottles. As mentioned, they actually seem to be in service for a bit longer than the flat "A" variant. This bottle comes in a spectacular range of color. With the exception of aqua, literally every color that you have ever seen an embossed western glob is documented in this bottle. If a collector is so inclined, it wouldn't surprise me to have 10 or more different color hues represented with this variant 3. Some spectacularly whittled examples have been seen, and also many examples are known with a somewhat large tapered top. The bottle has to be considered very common, probably over 150 known examples by my guess. Still, with many collectors striving to put together runs of color and variety, the nicer examples are not that easy to locate. If you are trying to purchase a very green example of this fifth, good luck with that. You are probably going to pay the ordinary J.F Cutter rate (x 10). I have noticed that certain glob fifths have an abundance of color range, the max. color era seems to be 1872-74, others not as much. Think of bottles that touch into this era; Teakettle(t-167), J.H. Cutter, Circle(t-43), J.F. Cutter(t-46var.3), others. The argument could be made that there were so many examples blown of the these common bottles that I just mentioned, that certainly there will be more colors found. Less common, but equal in colors, Blakes-Pond,Reynolds(t-114), Taylor-Virginia N.(t-151), Gold Dust(t-154), J.Moore(t-90), and of course the big kahuna, Clubhouse(t-119). I have always given special homage to a western glob fifth or flask that is found in what I consider the three base line whiskey colors; dark amber, yellow amber, green amber. Go for that triple on the early fifths and flasks, it really is a great look! If you can nail a trifecta on the (t-119), well, game over--you win! I have digressed .... sorry. I know there is confusion on the first three J.F. Cutter variants. I am just listing them as they are listed in Thomas' book Whiskey Bottles of the Old West, to avoid possibly even more confusion. The variant 1, "old stove pipe", and variant 3 "pointed A" are the same mold. The variant 2, "flat A" is a completely different mold. Maybe variants 3 & 2 should have been switched in sequence. Maybe the variant 1 is just a J.F. with nice big top, in your thinking. However you want to collect them, I am just trying to help identify them for you. The J.F.Cutter(t-46var.4) is not confusing. This is the last of the J.F.'s. Probably blown from around 1877 to 1884, give or take a year on each side. We don't find the variant 4's in Utah. The early mining period in U tah was from 1868 to approx. 1875-1876. As popular as J.F. Cutter Extra was in Utah, if the variant 4's were in service prior to 1876 we would be finding them. This bottle is easily identified by the "curved leg R's", the design on the base, and it is a more slender bottle than the other 3 variants. It appears to have a longer neck. I don't know what the standard was in filling these bottles with bourbon, half way up the neck, to the applied top, somewhere in between?. Maybe they actually measured the liquid in ounces (25.6 ounces = 1/5 gallon), I kinda doubt that. I haven't put it to the test, but I believe that the variant-4 J.F. 's probably hold an ounce or two less than the first three variants. These variant-4's have been found widely distributed through out the west, California, Nevada, Oregon, Washington, Arizona. Probably other states. Just not in Utah. This variant comes in some super colors, for a later 70's -80's bottle. There are a few green amber and greenish amber examples around. I have seen yellow amber examples, dark amber ones, all the colors that the variant 3 is found, except for maybe that light "apple green" color that the v-3 is known in. There are a lot of these variant-4's around, guessing again probably 150+. Generally speaking the variant 4 sells at a price slightly lower than the others, unless we're talking greenish hues. I don't know why this var-4 has a bit of a stigma attached, maybe because collectors and diggers think it is a newer bottle. Not that much newer! !Thomas indicates that the "older bottles do not have the design on the base", ... true enough... and "only the older, crude examples come with the glob top" .... not quite accurate, all four variants are seen with a glob top.... I have not seen a J.F. Cutter(t-46) with a tool or transitional top that I can remember. So there is the J.F. Cutter fifth info. I will post some more pictures as they come in, also some ads and other information in another post or two. Go out and dig a whittled, green variant-1. I'll give it 5 star write-up!!! Here is a photo of the "elusive one". Lou Lambert sent this in, calls it lime green. Nearly transparent, with a slight green tint. I have seen two broken ones this color over the past 30+ years. Blackie Owen dug one in Alta, Utah and had it glued together. I guess you could say it is one click further along on the "green-o-meter" scale than the normal "apple green" or whatever adjective "green" you want to call a green J.F. We need to develop a color coding system for these bottles. This same color is found in large circle Millers. I've never seen a whole one, just a couple of broken examples dug here in Utah. SICK! SEND ME SOME PICTURES OF YOUR BEST J.F. GREAT PICTURES SENT TO ME BY LANCE W. , DALE M., GEORGE B., LOU L. AND ANDREW K.
The gauntlet has been thrown down. Lets see those Star-Shield fifths. If you want to see the T-119 (California Clubhouse) trifecta take a look at the Ken Schwartz collection. Does he have three of them now?? Last time I was at his house there were "only" two. It may truly be game over!! I also only remember 2 at any given time.... first there was Thomas' green, then there were 2 pure greens. The second green example he then traded off. Now there's an orange-amber that was dug in San Jose in the early 1970s and one of the two green examples. Not sure which example it is, but it was either the example found in Belleville or the other that was found on the surface on the Saline Valley side of the Cerro Gordo area. There are only 2 pure greens known. I was at Ken's open house during the Anderson show this year and for the life of me can't remember exactly how many clubhouses were in his collection. I do remember all of the heavy western flasks that he has put in his collection since the last time I was there. If you collect or are interested in western fifths or flasks and have not seen Ken's collection its time to do so. It is possibly the finest collection of western fifths ever put together. The Anderson Bottle Show is always a must attend show for me and the Schwartz's Friday night open house the highlight of the weekend. Being a "flask addict', I thought I would mention that the J.F. flask comes in some nice colors, and occasionally has character to the glass as well, but certainly not as varied as the fifths. Curved "R's and flat topped "A"...I believe they were distributed at the same time as Variant 4 of the cylinders. What do you think? Maybe some J.F. flask photos posted? that off color green one is EPIC ! Who is lucky enough to own it ? I have dug a PILE of J.F.s but never anything close to a green one. The one we pulled last month was an early "fat boy", but was just "oliveish" amber. Nicely whittled and crude, it went to my partner. I don't even own one of those things. Slowly, I have "divested" myself of the Martin bottles.